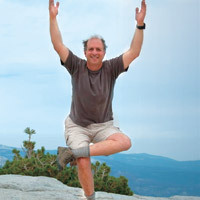 Stephen Newman, M.D., a family practice physician at the NorthBay Center for Primary Care in Vacaville, started taking yoga classes more than three years ago after he realized yoga’s stretching and balancing movements were providing many positive physical benefits for his family members. But he now enjoys those healthy benefits, and maintains them by joining yoga classes at least two times a week. Although it’s possible to learn yoga from reading books or watching a DVD, Dr. Newman prefers taking classes because an instructor is right there to correct improper positioning.